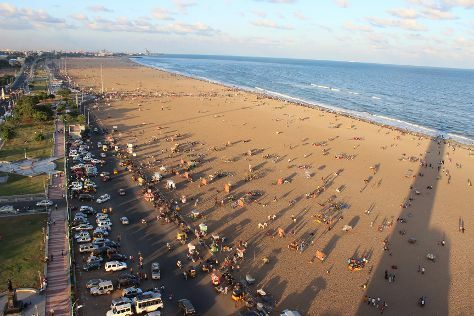 Kick off your visit on the 26th (Fri): take in the spiritual surroundings of Sri Parthasarathy Temple and then kick back and relax at Marina Beach. Keep things going the next day: contemplate in the serene atmosphere at Tirumala Tirupati Devasthanams, enjoy the sand and surf at Besant Nagar Beach, then admire the natural beauty at The Theosophical Society, and finally take in the spiritual surroundings of Kapaleeshwarar Temple. To see other places to visit, where to stay, maps, and other tourist information, go to the Chennai trip planner . New Delhi to Chennai is an approximately 5-hour flight. You can also do a combination of flight and train; or drive. Plan for a bit warmer nights when traveling from New Delhi in April since evenings lows in Chennai dip to 30°C. Finish your sightseeing early on the 27th (Sat) so you can travel to Goa. Goa is known for beaches, historic sites, shopping, nightlife, and spas. Your plan includes some of its best attractions: enjoy the sand and surf at Palolem Beach, tour the pleasant surroundings at Agonda Beach, see the interesting displays at Museum in Goa | San Thome Museum Goa, and take in the spiritual surroundings of Basilica of Bom Jesus. For reviews, ratings, more things to do, and other tourist information, read Goa trip itinerary planner . Traveling by combination of flight and bus from Chennai to Goa takes 6 hours. Alternatively, you can do a combination of flight, taxi, and train; or drive. Traveling from Chennai in April, expect nights in Goa to be about the same, around 34°C, while days are little chillier, around 36°C. Finish your sightseeing early on the 30th (Tue) to allow enough time to travel back home.